Prepared this dish for the girls. This is one dish that all of them like and don’t get to eat at their college cafeterias. Melt 1 Tbsp of butter in a heavy skillet over medium heat. Saute the bell pepper and garlic until the garlic starts to brown. Add the cream, mustard, egg, parsley, cayenne pepper, 1/2 cup bread crumbs and mix well. Fold in the crab meat and green onions. Cover, and refrigerate until ready to cook. In a separate mixing bowl, combine the remaining 1/2 cup bread crumbs with the Parmesan. Set aside. Divide the crab cake mixture into desired portions. 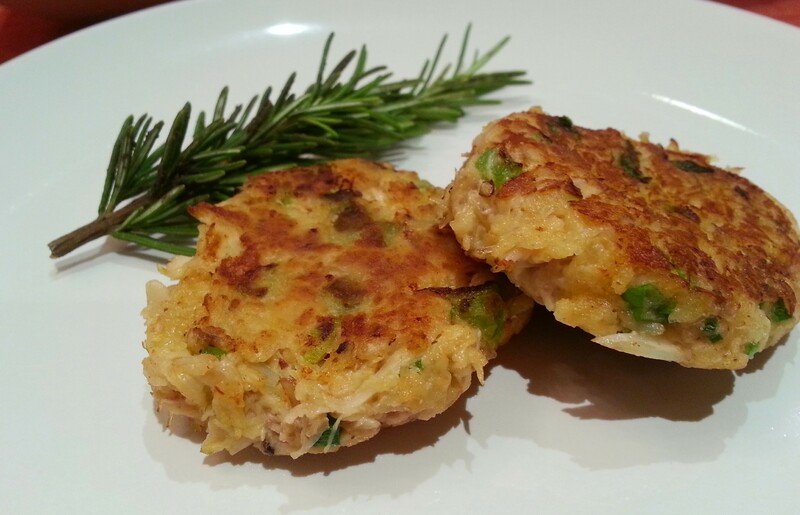 Shape the crab cakes into round patties, about 1/2 inch thick. Coat the patties with the bread crumbs mixture on both sides. Coat the skillet with the canola oil and remaining 2 Tbsp butter. Saute the crab cakes in the skillet until golden brown on each side.